Now, I did not choose today’s title just because it is election day in the U.S. I witnessed something yesterday that was nauseating, but it had nothing to do with politics. To spare you the horrific image, I did not take any pictures of what Delilah and I came upon during our afternoon walk. 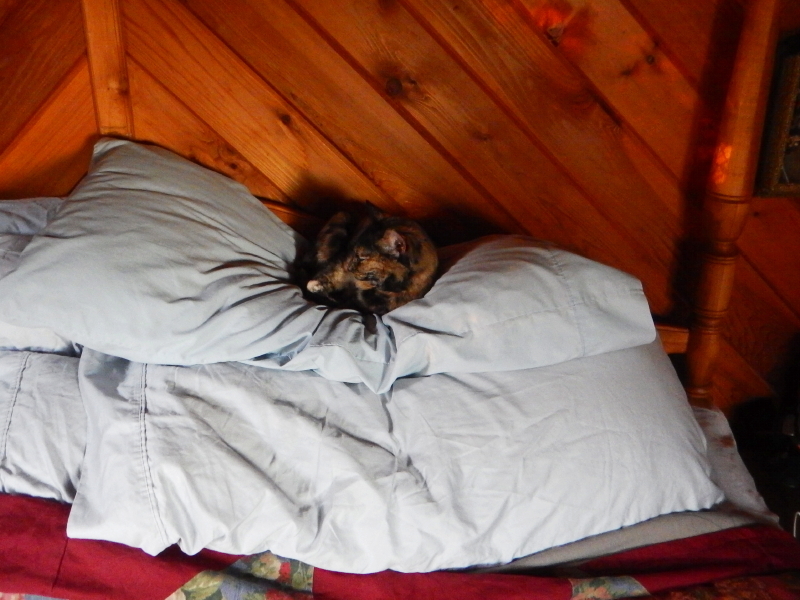 In fact, here is a difficult to discern shot of our cute cat playing queen of the pillows for you to view as a mental image cleanser after –should you choose to continue reading this post– you read my description of this unsettling experience. If you have a weak stomach for graphic details, avert your eyes now. Delilah’s nose sensed it first, but luckily, the disgusting find was off the trail and I spotted it in time to shorten her lead to keep her from reaching it. It looked like a basketball-sized animal had been turned inside out. I think it was a rib cage that was most prominent. When I got her a fair distance past the carcass, I secured Delilah’s leash to a gate in the pasture fence and retraced my steps for a closer viewing. I wanted to know what it was. I was also curious whether I could see a clue as to what animal was responsible for the kill. I knew right away the dead animal wasn’t a chicken because my initial glance had caught sight of a hairy hide. Plus, there were no feathers around. It was also bigger than our chickens. I spotted a foot and a tail that told me it was a raccoon. It was laying in plain sight in the middle of the main drainage ditch –currently saturated and flowing due to a continuing wet period of days lately– that forms our southern property line. Having the gross spectacle so prominently exposed next to our pasture, within sight of the chicken coop and horses, made me a little uncomfortable, but I wasn’t much interested in dealing with it while walking the dog on our way to feed and clean up after the horses. I settled for tossing it from the middle of the open ditch to some brushy growth on the far side, toward the neighbor’s property. When I picked it up by the tail, the surprisingly intact entrails dangled out from the gut. In the world of nature’s predator/prey relationships, I would say this was only a half-completed job. It was also one of the most disgusting things I recall ever picking up. Later in the evening, long after darkness had settled in (which now happens around 5:00 p.m.), I felt conflicted over having left the gruesome carcass where it would continue to attract attention. Maybe I should have bagged it and thrown it away. At the same time, I would rather have local predators feeding off raccoons than my chickens. But, it was uncomfortably close to where our chickens roam. Interesting side note: On Sunday, I spotted a beautiful bald eagle perched in a tree along that same drainage ditch. I fretted over the possibility it was eyeing our chickens. Maybe it was looking for raccoon carcasses, instead. Now I want to go look at some cute cat pictures for a while. In the last few days, we have come across a surprising number of animal parts that Delilah has collected from her explorations around our property. I think the melting snow might be revealing some carcasses that were preserved beneath all the white stuff this winter. At least, we hope that explains the dramatic increase in our exposure to the harsh reality of animal mortality lately, as opposed to the possibility that she has become that proficient of a predator. Cyndie buys a lot of chew toys for our dog, but none of those come close to thrilling Delilah as much as something biological. Oftentimes, we are unable to recognize what she has in her mouth, but it is easy to tell from her behavior and body language that it isn’t one of the toys. If we are lucky, we are unable to identify what it is. Somehow that is easier to stomach. I felt a bit nauseous yesterday as she chomped away on the very obvious body of a mouse. Then she comes inside and tries to lick our faces with her bad breath while we towel her dry and remove her blaze-orange vest. I decided not. Cyndie described the unlikely scenario of lifting one of the horse’s feed pans which had been flipped upside down in the paddock, and discovering the carcass of a headless rabbit beneath. We can’t imagine how it ended up there. Maybe one of the horses came across the body and purposely covered it out of respect. We also have a pile of feathers that Delilah has been working on, which I’m guessing came from one of the many wild turkeys roaming our land. In addition to the deer leg that has been a recent prize, she also is quite fond of chewing on a fair-sized piece of hide; both hoof and hide being something that a pack of coyotes might leave behind. Another harsh reality we are facing this weekend, with temperatures soaring well-above freezing, is the mud and manure mess we have been anticipating in the paddocks. When the ground here is saturated, it becomes so soft that you sink to the point of losing a boot in many places. That means we don’t dare try driving the tractor into the paddocks now to remove the abundant accumulation of manure. It would sink past the axles. This will be a nasty problem to endure while waiting for the soil to dry out. It is our first spring with the horses, and this worst-case scenario has us biding our time until we can engineer a remedy, which will likely be a combination of altering landscape to improve drainage, and adding some sand/gravel to a few key areas to improve their footing. All this “reality” certainly does help to accentuate how far we have come in our move from the refined environment of our previous life in the suburbs. I came up empty this morning. Not for lack of trying. I trudged our woods and beyond, into the neighbor’s section of forest adjacent to us. I found no obvious evidence that revealed what all the coyotes were howling about last night. Just about the time we were turning in for the night, the racket of coyotes in a tizzy, which we are now familiar with, after our initial exposure last October, filled the darkness from down the hill below our house. I cracked the window to better hear the chorus, and Pequenita leaped to the window sill to join me, her interest piqued. Grabbing the spotlight that we now keep handy in our bedroom, I scanned the distance. It didn’t do much. Since the land drops away so quickly, the only view I get is of the open space near the house, across the top of the hill. 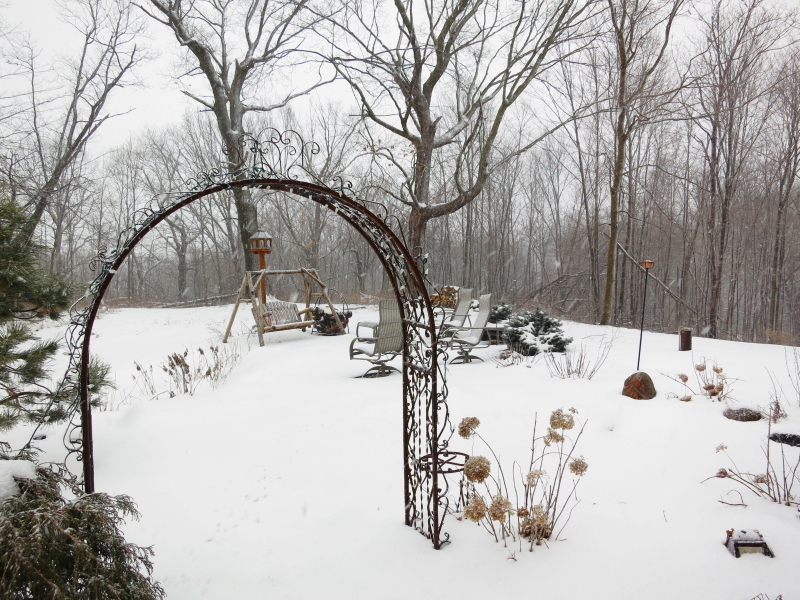 I am including a daytime shot of the area we are able to see from the bedroom window. From the sound of things, and from the fact the howling continued on and off for some time, we expected the coyotes had captured a meal. My search this morning was for tracks that might lead to the remains of their prize. Last fall I hadn’t put two and two together to realize that what we had heard might mean there would be a carcass. It was mere coincidence that I was exploring our woods, days later, bushwhacking off trail, and came upon the fresh skeleton of the 8-point buck. That was before there was any snow cover, and the scene hardly stood out at all. This time, I figured such a kill would be much easier to spot, since there is still so much snow on the ground. What I discovered was that the woods still obscure the sight-lines quite a bit, and it wasn’t easy to positively identify which tracks were fresh from the night before. The coyote tracks I did find seemed meandering, certainly not racing after prey. I was also looking for evidence of more than one set of paws, because we definitely heard more than one animal yipping. There are plenty of tracks from rabbits, squirrels, deer, and one very definite and obvious trail of a single turkey. None of them looked to be on the run. Eventually I did come upon a pair of coyote tracks, side by side. Maybe there wasn’t a chase. It could have been a surprise attack from a stealthy hunter. Whatever it was, I didn’t find the results. They were heard and not seen. There remains the outside chance that it wasn’t a new kill at all. During my trek, I wandered past the spot of that kill from last fall. Enough snow has receded to expose the old carcass, and the legs and hooves that were left as undesirable last fall, had been pulled up and freshly gnawed. It is quite possible that the reason my search was futile is because there was no fresh kill. Maybe they were just excited to have found the remains of that old kill. But, I’ll be keeping an eye out for a new carcass, because I’m not quite convinced.